with Nightingale Island behind, was first published in the Tristan da Cunha Newsletter. 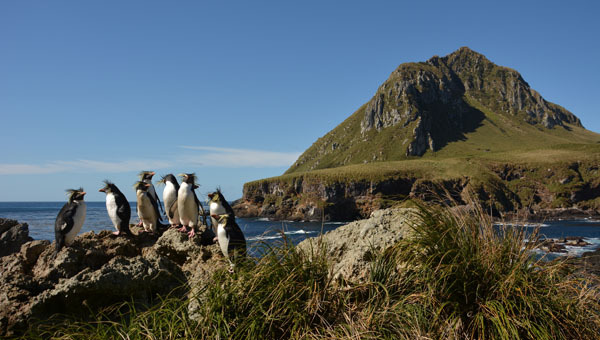 Five scientists travelled to Tristan da Cunha on the 2018 SA Agulhas II outward voyage and were then landed on Nightingale and Inaccessible Islands by the ship's helicopter in early September. Team members Norman Ratcliffe and Richard Philips from the British Antarctic Survey, together with Ben Dilley, from the FitzPatrick Institute of African Ornithology, at the University of Cape Town were on Nightingale Island for the duration of the 2018 Agulhas trip. Norman Ratcliffe studied Northern Rockhopper Penguins, Richard Phillips Atlantic yellow-nosed albatrosses and Ben Dilley has continued his previous studies of the Nightingale bunting species, particularly focussed on the Wilkins bunting. Peter Ryan, Director of the FitzPatrick Institute of African Ornithology, at the University of Cape Town and his colleague Maelle Connan were transported by the Agulhas helicopter to Inaccessible Island. Maelle travelled back to South Africa aboard SA Agulhas II and Peter was joined by Ben Dilley, after his Nightingale work was complete. Tristan Conservation Department members Julian Repetto, George Swain and Leo Glass will travel to Inaccessible when a safe sea journey by RIB can be made. Administrator Sean Burns and his wife Marina also plan to travel to the UNESCO World Heritage Site island with the team. We will aim to update this page later and hope to publish details of the field work in the February Tristan da Cunha Newsletter.